Many stories have been told in the Resident Evil universe since the t-virus, Umbrella Corporation, and Raccoon City debuted in 1996. The Resident Evil lore hole is deep and maddening. The episodic Resident Evil: Revelations 2 starts tomorrow, and no one would blame you being confused! Let's clear things up. First of all, Revelations 2 takes places between Resident Evil 5 and Resident Evil 6, and follows Claire Redfield, Moira Burton, and Barry Burton as they attempt to escape a dangerous island. In that sentence alone, there's a lot to digest. Sisters! Daughters! Fathers! Six games! But Resident Evil 7 isn't here yet, so we're stuck with the convoluted stories Capcom's been weaving since the 90s. Whether you're a fan or a newcomer, I've got you covered. Let's go! Thanks to the Resident Evil Wiki for clearing up some of my clouded teenage memories. In Resident Evil 2, Claire heads to Raccoon City in search of her brother, only to find a town full of zombies. Not good! The idea of finding Chris is quickly abandoned, as Claire focuses on getting the hell out of the city. The epilogue for Resident Evil 3: Nemesis reveals Claire left Raccoon City with a newfound determination to find her brother and the people responsible. These "people" are, of course, the Umbrella Corporation, a massive pharmaceutical conglomerate with a tendency to develop things that get out of their control, like the t-virus. Three months later, while investigating an Umbrella facility in Paris, Claire's kidnapped and brought to Rockfort Island. This sets up the events of Resident Evil: Code Veronica, where she's forced to escape Rockfort Island due to a viral outbreak purposely caused by a rival company. At this point, bioterrorism has officially become a regular occurrence in the Resident Evil world. Claire discovers the location of Chris, but their reunion is short lived, as the two are again separated, this time exploring a secret Antarctic base. Now, Chris is looking for Claire. When he does, they're able to blow up the base on their way out, and set out to take down Umbrella. Though Claire in other Resident Evil games, they're either re-tellings (Resident Evil: The Darkside Chronicles) or non-canon spin-offs (Resident Evil: Operation Raccoon City). Her story moves forward in the the CG film Resident Evil: Degeneration, as brother and sister went their separate ways. Chris joins the BSAA (Bioterrorism Security Assessment Alliance), while Claire partners up with TerraSave, a group focused on helping victims of bioterrorism. In Revelations 2, Claire is still with TerraSave. The story picks up during a TerraSave party. "My dearest Moira and Polly. I hope you will grow up to be strong and beautiful women and help to cheer up mother. Your father will watching you all from heaven." What happens to Moira after Barry's escape the Spencer Mansion remains a mystery, though Revelations 2 should fill in some of the historical gaps. Revelations 2 opens with Moira having joined TerraSave, the same group Claire's been working for. It appears Moira and her father don't get along well, and Moira had a traumatic experience that left her deeply afraid of guns. In my book, there's not a more lovable character than ol' Barry Burton. The charming buffoon with a heart of gold, it was impossible to finish the first game without coming to love the guy. Don't believe me? Let's relive a classic known as the "Jill Sandwich." Barry ends up in Raccoon City because he became friends with Chris Redfield while the two were in the U.S. Air Force. In fact, he actually recruits Chris to S.T.A.R.S. (Special Tactics And Rescue Service), a specialized division within the Raccoon City Police Department. What was a small-time police department doing with an elite police force? Guess what: Umbrella funded it. S.T.A.R.S. is split into two teams: Alpha and Bravo. Alpha's lead by Albert Wesker, and Bravo's lead by Enrico Marini. It's Marini who reveals there's a traitor in the mix, though he's immediately killed. Later, Albert's revealed to be the puppet master orchestrating the disaster. When S.T.A.R.S. is called out to the Spencer Mansion, Barry's approached by Wesker and told his family's in danger. Wesker's an undercover agent for Umbrella, and if Barry doesn't help cover this fact up, Barry's family will be killed. Oh no! Stuck in pre-cell phone era, Barry chooses to believe Wesker, and is responsible for Jill Valentine and others getting into lots of danger. Wesker eventually admits Barry's family was never in any actual danger. D'oh. As mentioned above, it's possible for Barry to die in the original game. The canonical ending Capcom chose to go with, however, involves Barry surviving. In a surprise cameo, he shows up with a helicopter and saves Jill from Raccoon City at the end of Resident Evil 3: Nemesis. 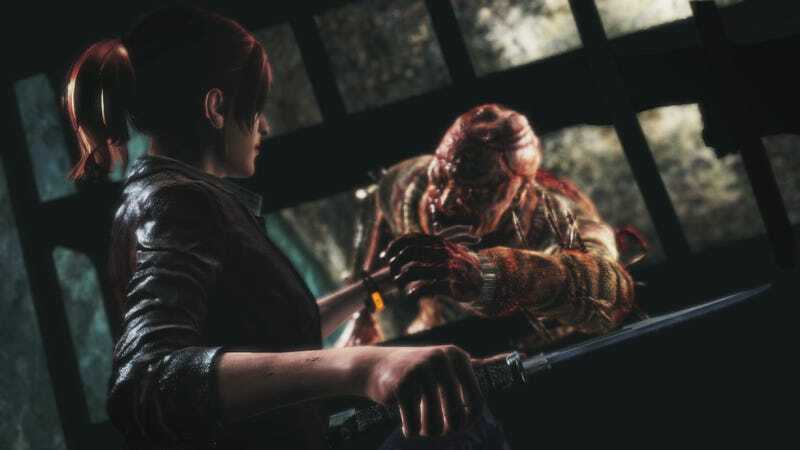 As a fan favorite, Barry has been playable in multiplayer modes for other Resident Evil games, but it's not until Revelations 2 that Capcom decided to make him part of the main storyline again. It's unclear what Barry and his family have been up to since the events at Raccoon City, but Revelations 2 opens with him airing a disagreement about his daughter's career choices. While my head hurts a little bit, it's fascinating how long Capcom's kept this storyline going. Look for my impressions of Resident Evil: Revelations 2's first episode on Kotaku tomorrow!